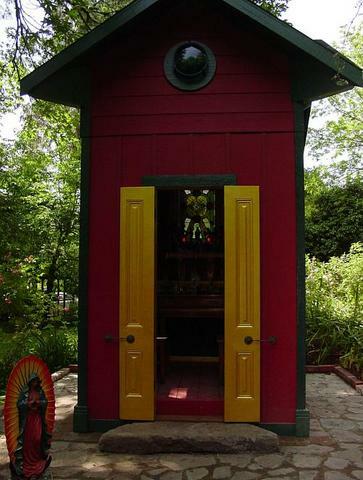 is the World's Smallest Spiritual Church. with 4096 square inches of floor space. With an exterior dimension of 36 square feet Missionary Independent Spiritual Church in a close race with a couple of other churches for the title of "World's Smallest Church." We may indeed be the church with the smallest amount of floor space -- and we are certainly the ONLY tiny church of those in contention where services are held DAILY -- that is, we are a fully functional CHURCH and not a mere "chapel." One question we are occasionally asked is, "If your building is really a church, why isn't it painted white and why doesn't it have a steeple?" 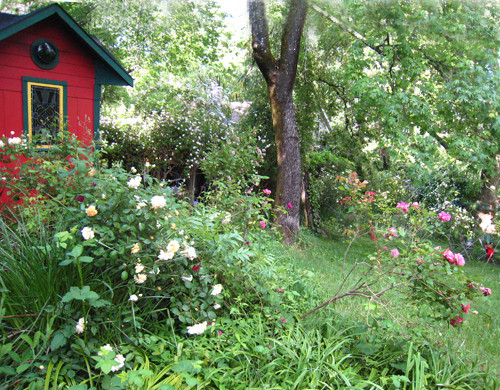 The answer lies in the history of the vernacular architectural styles of early California, and also rests upon our service to an interfaith religious community that embraces Christian, Jewish, Taoist, Animist, Hindu, Wiccan, African Traditional, African Diasporic, Druidic, Buddhist, Pagan, and other religious architecture traditions. Missionary Independent is painted red and green throughout, with yellow and gold highlights, in homage to the Chinese Joss House architecture of early California. Joss Houses are small Chinese temples, many of them dating back to the Gold Rush era, a time when Cantonese immigrants flocked to the Western United States. They were built in the local wood-frame Victorian vernacular style sometimes called "carpenter's gothic," but were brightly painted with traditional Chinese temple colours. The interior of the Missionary Independent Church contains a central altar, two seats, amd a pull-out table for the use of spiritual readers. The main altar is constructed on three levels, one above the other, each containing statuary of deities -- gods and goddesses whom people of varied cultures have worshipped as manifestations of the Divine. Enter the tiny building by means of its gilded double-doors and you will see that it contains two gilded windows that open, a large fixed stained glass window behind the main altars, and four circular stained-grass vents. There are four hand-made wrought-iron candle altars in the corners, with room to burn a total of 64 novena or vigil lights at one time. Candle services are conducted daily. A pull-out oak table stored under the altar and a pair of matching antique oak chairs provide seating for two when spiritual readings are conducted. Readings in the church may utilize age-old methods such as mediumship, clairvoyance, palmistry, crystal ball, tea-leaves, geomancy, Chinese fortune sticks, dice, astrology, I Ching, and pendulum divination, according to the gifts of the reader present at the time. In addition, two outdoor chapel shrines flanking the entrance contain additional religious statuary from various cultures, overflow candle racks, and a large Indonesian gong that is banged to call people to worship service each morning. Believe it or not, the Guinness Book of World Records no longer lists "World's Smallest Church" as a category of world's record -- at least not at their web site. The "World's Smallest Church" listed by the web-based Roadside America database at http://www.roadsideamerica.com/set/church.html is Cross Island Chapel in Oneida, New York, located on an island in the middle of a pond and only "open occasionally" and "reachable only by boat." Cross Island Chapel is listed as having a "floor area" (not exterior dimensions) of 51 inches by 81 inches, for a total of 4,131 square inches (28.6875 square feet) of floor space. Missionary Independent Spiritual Church, on the other hand, has a floor area of 64 inches by 64 inches, for a total of 4,096 square inches (28.4444 square feet) of floor space. Missionary Independent Spiritual Church is both 35 square inches smaller internally than Cross Island Chapel, and it is also -- unlike Cross Island Chapel -- a fully functional church that is open to the public 7 days a week, where spiritual services are held DAILY. We would be willing to compare exterior measurements, should Cross Island Chapel choose to provide theirs: The exterior dimensions of Missionary Independent Spiritual Church are 72 inches by 72 inches wall-to-wall, and 75 inches by 75 inches counting the decorative external trim. Construction is wood frame; the building was completed in 1961 and restored in 2006. Visitors are welcome at any time during open hours and may sit in quiet meditation or prayer. Candle Services, with the setting of lights for spiritual aid of parishioners and the public, are held daily. Spiritual Readings by traditional means such as tarot cards, palmistry, pendulum, and clairvoyance, are held on the premises and by telephone consultation. Admission is free, but donations are requested for Spiritual Readings and Candle Services. Take California State Highway 101 to Santa Rosa, California. From Santa Rosa, take Guerneville Road west to the end of the road at a 'T' intersection with Highway 116. Turn right (north) on Highway 116 and proceed to the town of Forestville. As you enter Forestville, the road makes a sweeping uphill left-hander, and at the crest of the hill you'll see Carr's Drive-in on the right. This is the junction of Covey Road and 116. Turn right (north) on Covey Road and pass between two churches (a large tan one on the left and a small white one on the right). Cross Center Street and continue for one-half block and on your left you'll see a post with the number 6632 in white lettering on green tiles, atop a larger black-and white sign that reads, "Drive Slowly. 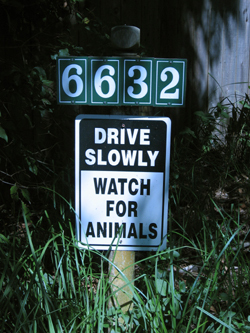 Watch for Animals." Enter the driveway, which is lined with rose bushes, apple trees, and fence posts on which there are nailed abalone shells. Drive to the top of the hill and park by the big old white barn, where an old yellow and black sign says "Customer Parking. 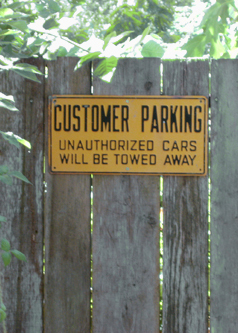 Unauthorized Cars Will Be Towed Away." Walk across on the sidewalk to the bright red church building, in front of the grey building (an occult shop). If you get lost: You may telephone for more detailed directions: 707-887-7808.